This study showed that public reporting of the adenoma detection rate (ADR) of 11 gastroenterologists resulted in significant improvement- 5% overall and 7.8% for screening colonoscopies. Also, a natural language processing software was successfully used to abstract the relevant data from more than 20,000 colonoscopy reports and associated pathology reports. Figure 2. Adenoma detection rate by physician in pre- and post-reporting periods. ADR is an important quality measure of colonoscopy. An inverse relationship has been shown between ADR and the development of subsequent interval colon cancer. 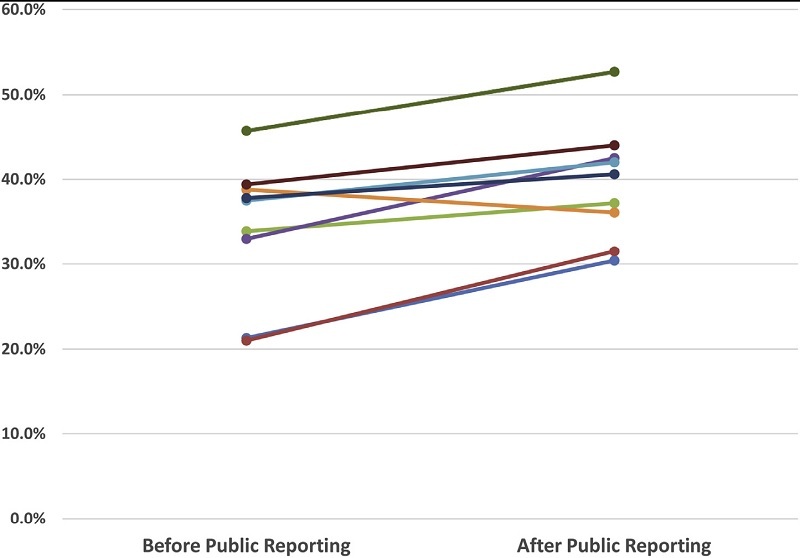 Benchmarks for ADR have been defined and it is imperative that endoscopists maximize their detection rates.This study highlights that monitoring and public reporting of individual ADR can serve as a quality improvement tool. Public reporting and monitoring of the ADR of endoscopists can serve as an improvement tool for this important quality measure of colonoscopy. Natural language processing software can abstract data related to quality of colonoscopy from the procedure and pathology reports without the need to manually comb through these reports.